Forgot Windows 8 password for your ThinkPad Tablet 2? How to unlock or reset ThinkPad Tablet password? Lenovo ThinkPads shipped with Windows 8 preloads are configured in UEFI mode. Legacy-based boot media will not boot successfully on UEFI based computer. In this tutorial we'll show you how to create UEFI bootable USB media and then use it to reset forgotten Windows 8 password on ThinkPad Tablet 2. Before resetting ThinkPad Tablet password, you need to use another computer to make a bootable PCUnlocker USB drive. 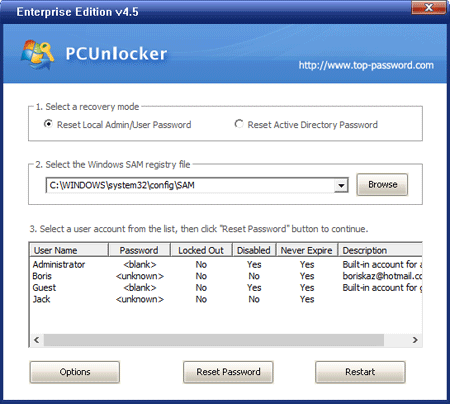 Simply download the trial version of PCUnlocker Enterprise, unzip the downloaded file and you'll get an ISO image file called pcunlocker.iso. Next download and install the freeware ISO2Disc. Run the ISO2Disc program, click on Browse button to select the PCUnlocker ISO image, then choose your USB drive and select GPT partition style. Click on Burn. A UEFI bootable USB media will be created in minutes. Insert the USB boot media into the USB connector of your ThinkPad Tablet 2. When turn on the tablet, press and hold the power button together with the volume up button at the same time until the Lenovo logo appears. Once into the ThinkPad Setup (BIOS), select Security menu and then disable the Secure Boot option. Navigate to the Startup menu. On the Boot submenu, select USB Drive, and then tap "+/–" until the USB Drive is shown as the first startup device. Save your changes and exit BIOS. The tablet will then boot from USB media. After a while, you'll see the PCUnlocker program and it shows you a list of local accounts existing on your ThinkPad Tablet 2. Choose a local account and then click Reset Password button, it will reset your forgotten password immediately. If you're using a Microsoft Account with your ThinkPad Tablet, choose the local account associated to your Microsoft account and then reset its password. Restart your Lenovo ThinkPad Tablet 2 and disconnect the UEFI bootable USB media. You can then log in to your Windows 8 ThinkPad Tablet without a password. It's that easy!